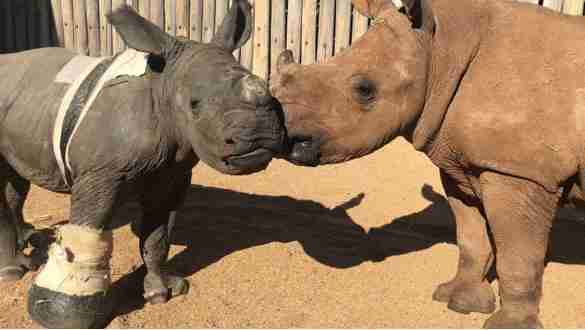 "Watching orphaned rhinos bond together and overcome their trauma is truly a piece of rhino magic." 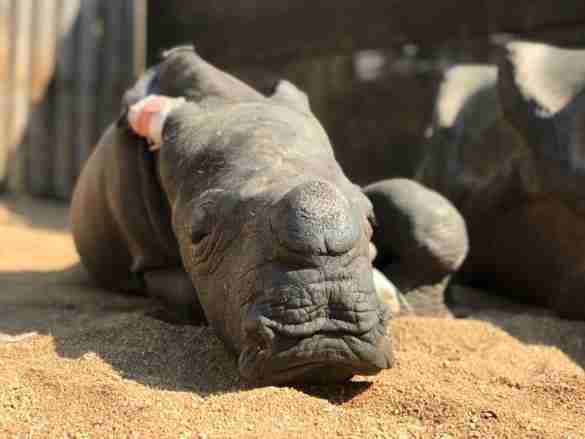 When a new tiny rhino arrived at Care for Wild Rhino Sanctuary in South Africa, he needed all the help he could get to survive. 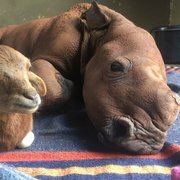 Arthur was found curled up near his mother's lifeless body late last month and brought to the sanctuary by a South Africa National Parks (SANParks) veterinarian. 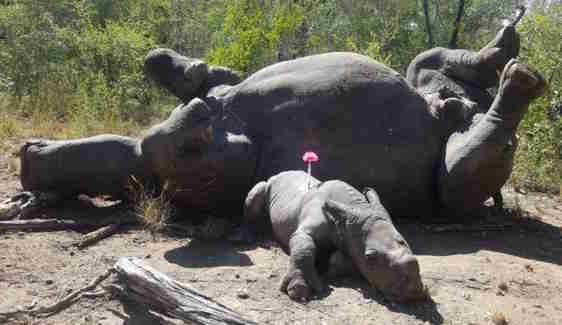 The poachers who killed Arthur's mom also wounded him on his foot and on his back with a machete, to get him out of the way. While veterinarians have treated Arthur's physical wounds, Arthur also needed help to recover from his emotional scars. 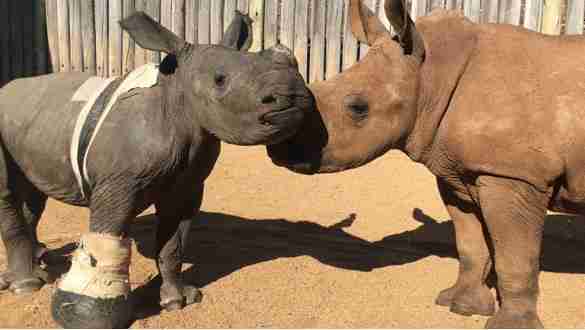 Because baby rhinos generally stay with their moms for their first three years of life, having the company of a rhino friend will prove crucial to Arthur's recovery. A rhino named Summer — who was also orphaned at a young age and is now 6 months old — was just introduced to Arthur in hopes that she could help him. When Summer first saw little Arthur, still bandaged around his back and his foot, she immediately approached him and started to touch her nose to his. Arthur seemed to love feeling the nudge of Summer's nose — at one point, the sides of his mouth seem to even turn up a bit. 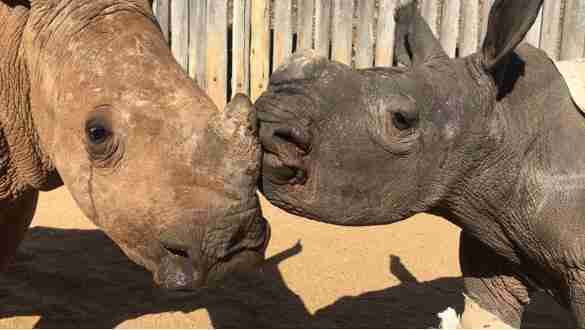 "They already love spending time with each other and love to play together," Petronel Nieuwoudt, owner of the sanctuary, told The Dodo. "We can see he is going to be a big, strong bull and we are so proud of him." Ever since meeting, Summer and Arthur can't seem to get enough of each other. "After spending just a matter of days together, Arthur and Summer are already showing a beautiful bond," the sanctuary wrote. "Arthur and Summer met like old friends and are clearly happy to be together." The people at the sanctuary keep in mind just how important socializing is for their rhinos as they grow and recuperate from traumatic experiences. And introducing rhinos to their new families is a heartening vision that helps everyone feel hopeful after such sad circumstances. "Rehabilitation is made much easier when the orphans can be together to form bonds with other rhinos," the sanctuary explained on Facebook. "Introductions such as these are extremely important, but also very special to watch. 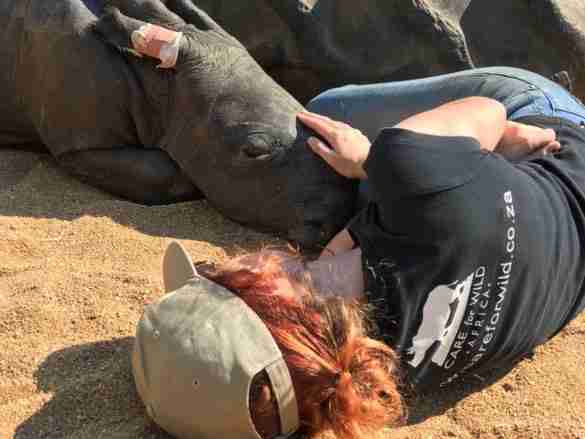 After coming from equally tragic circumstances, watching orphaned rhinos bond together and overcome their trauma is truly a piece of rhino magic." Arthur and Summer will grow up together at the sanctuary, and, assuming all goes well, eventually be able to return to the wild. 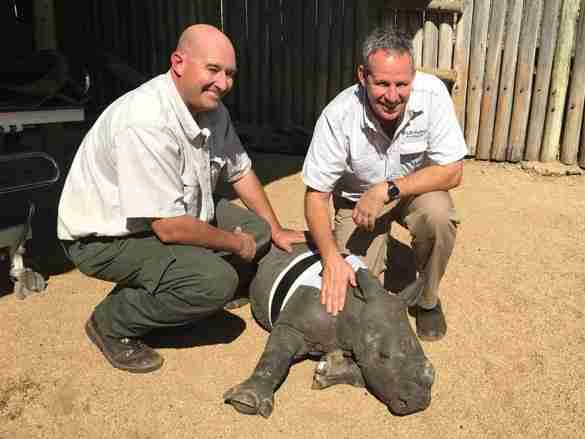 "We are optimistic about his healing," Nieuwoudt said. "He has done amazingly well so far!" Arthur is already much stronger — he's even practicing how to charge with a little toy tire in the yard. Rhinos are under threat because of a demand for rhino horn, valued because it is falsely believed to be a cure-all in Asia. Until this demand is decreased, there will continue to be more stories like Arthur's. You can help Arthur and his friends grow up strong by making a donation to Care for Wild Rhino Sanctuary.